This recipe combines three great dessert components- cinnamon buns, pudding and fruit. I love cinnamon rolls and I am always up for finding a new exciting recipe for them. If you haven’t yet, you should also check out my Buttermilk Biscuit Cinnamon Buns; those are seriously to-die-for. 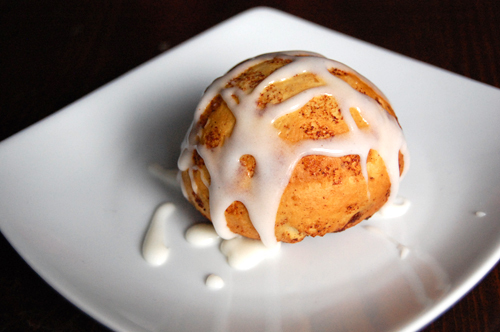 These stuffed cinnamon roll bites are a great way to impress guests, perfect for a holiday treat… or anytime really. Open cinnamon roll canister and cut the dough into 16 equal pieces. Wrap each piece around one raspberry and roll in hands to create a balls. Place each ball on a greased baking sheet. Bake at 375F until golden brown (about 12-15 minutes). Let cool for about 5 minutes, then use a piping tip or squeeze bottle to fill each bite with vanilla pudding. Drizzle frosting over each bite before serving. Oh man, all that yummy goodness stuffed inside! Well boo on Pillsbury! You would think they would send out letters or email-something to let you know or at least thank you for participating if you did not win. You may still get something-just about the time you have forgotten that you ever participated. I think that the filling idea here is genius and no doubt delicious! I would like to thank you, instead of Pillsbury, for creating this tasty treat and posting it here on your blog. Have a great day! Pffftth! What does Pillsbury know? This is totally delicious! And a little bit naughty 🙂 Love it! This is a brilliant idea. Great for an easy, but elegant breakfast for guests! These look quite decadent! It’s Pillsbury’s loss! Thats ok I wasnt contacted either. I am sure your cinnamon roll bites were as good as they looked. Thanks for sharing with us. Oh well there is always next time right? Oh what to do with that million dollar prize? Pillsbury doesn’t know what they are missing. I am just loving that you stuffed them with raspberries. You had me at that step. Great job! Can’t believe this didn’t make the cut! The picture alone is making me drool. 🙂 I love the raspberries too, sounds amazing! Thanks for this recipe Jenny, looks delicious. Yeah, Pillsbury is missing out. 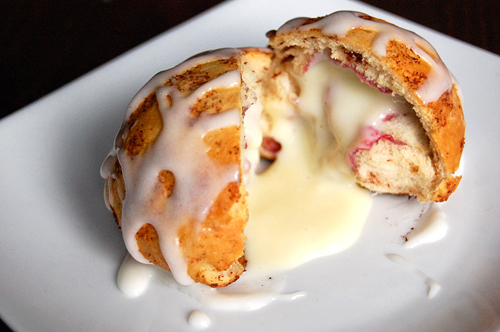 I love your idea of filling the raspberry filled cinnamon roll with vanilla pudding! That is a great combo, and it’s easy to make too. This makes an easy snack that can be made on a busy weeknite! Oh that is a lot of deliciousness in one little roll. I can’t imagine why Pillsbury wouldn’t pick this…oh well their loss! OH MY GOD these look amazing!!! Cinnamon rolls are delicious – but stuffing them? Great idea. Thanks for stopping by my blog. Congrats on your graduation. I almost licked the screen. Too bad Pillsbury. What a fabulous idea! These look soooo good, drooling, don’t want to go visit others today, I just want to stare at these! You made the cut on my Favorites! Yummy!